But I don’t need a Ron and Hermione. I’ve — I’ve got a friend, Scorpius, and I know you don’t like him but he’s all I need. And lost myself in it's pages for the remainder of the day. The first thing I should tell you is that The Cursed Child was absolutely written for performance. I would truly love to see the play live on stage. Undoubtedly the characters would become even more human, complex and believable were it possible to see them in the flesh, and the effects would be spectacular! The second thing is that you really should not be put off by the myriad of negative reviews. I know there are a lot of plot holes and themes which dedicated Potter fans are not afraid to show their disapproval of. In my opinion, there are far too many positive aspects of the play for these to be problematic. The Cursed Child begins thirteen years after the conclusion of The Deathly Hallows, delivering Harry as a married father of three. Strange things are happening in the wizarding world, and when his scar begins to throb again he fears the return or influence of "He who may not be named". Harry's youngest child, Albus, is about to begin his education at Hogwarts. and is fraught with concern over the sorting ceremony. Like his father, his elder brother and sister were sorted into Gryffendor, but he's not convinced that he'll be bestowed with the same house. 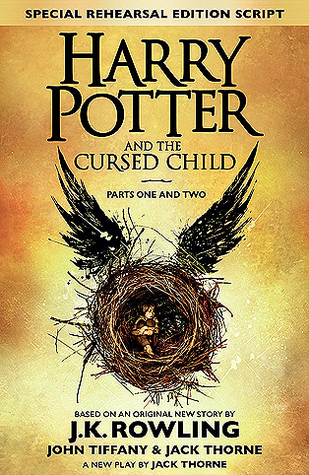 I really, really enjoyed reading The Cursed Child: it is, without a doubt, a wonderful story all on it's own and encompasses themes of friendship, loyalty and the danger of trying to please others at the expense of your own identity. Perhaps one of these days I'll get around to reading more of J.K. Rowling' continuation of the wizarding world on Pottermore!